Dylan Evans seems like an average college kid, one whose parents made sure to be involved in their son’s life and worked hard to give him the chance for a quality college education. As a high school honors student, he strived for a high ACT score and worked to save money over the summer so that he could have his own apartment when he enrolled in college. His mother, Brooke Wyant, a teacher at Riverdale High School, made sure to teach her children the value of education. She instilled in Dylan a work ethic that propelled him to win an MTSU academic scholarship. But this average kid with an above-average work ethic displayed extraordinary bravery when he spoke candidly about his devastating synthetic drug addiction at a recent meeting of TN-0, a task force composed of law enforcement officials and community leaders. He soon spent all of the money he had saved on the legal drugs, pawned valuables he stole from his mother’s home to support his addiction, and charged thousands of dollars to his mother’s credit card. “The charges on my bill looked just like normal charges at a gas station because they could be bought at any convenience store,” Wyant said. Needless to say, Dylan soon dropped out of school and lost his scholarship. He later overdosed and attempted suicide in the hospital. “A college career down the drain, a life ruined because of something that could be bought at a convenience store with my debit card,” Brooke said. At the meeting, officials from the Rutherford County Sheriff’s Office showed video of users’ behavior while under the influence of the drug, including images of a young man unable to give his name to officers while laughing, crying and screaming uncontrollably. Dylan’s drug of choice was Molly’s Plant Food, one of a number of legal products known by many names sold for anything but their stated use. 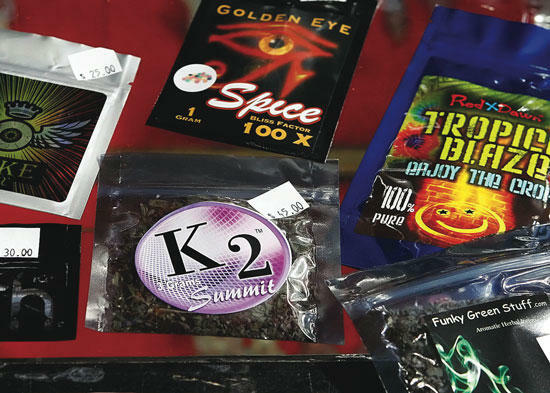 The drugs are synthetic forms of marijuana or methamphetamine, and go by several names such as bath salts, Vampire Blood, incense, glass cleaner and spice. The names and the chemical compounds they contain are constantly changing, making the criminalization of their sale or use particularly challenging to lawmakers and law enforcement alike. They can be smoked, snorted or injected. But the measure is only temporary and other legal compounds, which are responsible for widespread addiction, cannot currently be criminalized because they are also used in the pharmaceutical industry, frustrating law enforcement officials. Stanfill added that calls to poison control centers in Tennessee rose from 303 in 2010 to 4720 calls in 2011, with the vast majority of cases related to synthetic drug use. For their part, the Tennessee Bureau of Investigation and area law enforcement agencies, including the Sheriff’s Office and the Murfreesboro Police Department, did what they could in early September to get as much of the drugs as possible out of area convenience stores by raiding numerous establishments and charging the owners with possession of paraphernalia and intent to resell. “What we confiscated can easily be manufactured today and be back on the shelves tomorrow,” he said. Arnold and state Rep. Mike Sparks (R-Smyrna) are pushing state and federal officials to completely outlaw the drugs and make their use or sale a felony. Sparks is sponsoring legislation in this year’s session of the Tennessee General Assembly to do just that, and he feels the owners of stores who sell the products should have their licenses to sell beer or tobacco revoked. In the meantime, Sparks and former detective Kathy Hines created the TN-0 task force in order to help educate the community about the dangers of legal synthetic drugs and to push state and federal officials to outlaw their sale. Members of the task force include state and local law enforcement officials, community members, elected officials and members of Rutherford County’s legal community. Speakers at the Jan. 6 meeting repeatedly stressed the importance of educating children and parents, no matter how high their academic achievement or social status. “I don’t care who you are, it can happen to you and your child,” Hines said. If Dylan’s brave testimonial is any indication, Hines’ emphatic statement is certainly no exaggeration.